Superalloy foams could make ship and aircraft engines much quieter, new research suggests. The engine and exhaust system of a jet are the aircraft's main sources of noise, but jet engines are far too hot for materials typically used for sound deadening such as polymer foams. One possibility for reducing aircraft engine noise is to marry regular sound insulation with extremely heat-resistant metal superalloys like those already used for the jet's turbine blades. Regular polymer foams can be used as a template from which to create heat-resistant sound-suppressing superalloy metallic foams, showed Wei Zhai and Xu Song from the Singapore Institute of Manufacturing Technology at A*STAR, and their colleagues. The team developed a technique in which they coated a slurry of the nickel-based superalloy on to a polymer foam, then burnt off the polymer to leave behind an open-cell metallic foam with the same structure as the original polymer. Inexpensive polyurethane household cleaning sponges make good foam templates, Zhai says. Now, teaming up with Xiang Yu and Fangsen Cui from A*STAR's Institute of High Performance Computing, the researchers have developed a predictive model for optimizing the metallic foam's pore structure for a given task. First, they produced a range of metallic foam structures by growing them on polymer templates with a range of porosities and pore cell sizes. The researchers then tested the acoustic properties of these metallic foams, to measure how foams with different pore structures soaked up sound. This data formed the bases of the predictive model. The team found that, generally speaking, sound absorption is better when the pores are smaller. The smaller the pores, the longer and more difficult the sound wave's path will be through the material, and the more time the material has to damp sound energy by converting it to heat — a phenomenon known as the thermo-viscous effect. The next step is to better control the template replication process, so that a tunable gradient of pore sizes can be formed within a single foam block. "The sound absorption and mechanical performance of such gradient metallic foams will be further improved," says Zhai. The metallic foams' exceptional properties in addition to sound absorption—low weight, noncombustible, and structural strength—has great potential for aircraft and ship engine and exhaust components. 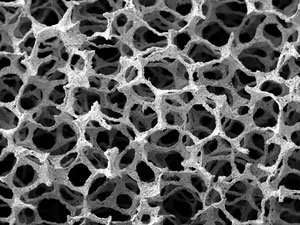 "The improved foam could be used as the core material of a sandwich-structured composite material, which possess both mechanical strength and acoustic damping performance in one component," says Zhai.